There are many alternatives for bathroom floorings. But choosing the right option is not easy, because the floor of this room needs to be durable, waterproof, easy to clean, and attractive. Due to the foot traffic that any bathroom receives regularly, choosing the correct flooring which is also functional is a vital task. Typically, any type of stone (marble, limestone, granite etc.) is a great option because stones don’t lead to humidity problems. But, stone can be slippery and cold which prevents many homeowners from installing it in their bathrooms. In order to avoid slipping on stone when its wet, a texture can be added to the surface of the stone. Naturally textured stone is also available and can be purchased easily. Also, if you’re among those who love the look and feel of stone, you can choose to install in-floor heating before having the flooring installed. When it comes to flooring options available for the bathroom, carpets are among one of the most popular choices to be installed. Even though they may not be the wisest choice, carpets are considered to be comfortable. However, they are not water resistant and can deteriorate early and grow mildew and mold. If installing carpet is a must in your home, you should take preventive measures to provide as much protection as possible. Laminate flooring is an inexpensive option that is also available. It’s extremely durable and easy to maintain. Due to its layer of melamine, laminate is very strong and water resistant. Similar to stone flooring, ceramic is waterproof and can be heated. However, ceramic tiles are less expensive and have fewer issues. There are numerous options available for this type of flooring enabling you to find something charming and unique. For instance, people who love the look that hardwood flooring provides can find wood-like tiles for their bathroom. Installing rubber flooring provides a real style-edge to the bathroom. It’s available in many different colours and styles, making it one of the most popular options for many. With the correct choice, it has the ability to make your bathroom look fantastic. With the right fitting technique, the flooring can be made waterproof too. Due to the plywood base that engineered wood has, this flooring option holds up very well against moisture. The top-most layer looks exactly like hardwood because it is made of wood. The main difference lies in the layers underneath, which creates an extremely sustainable product. Also, engineered hardwood is a soft material much more comfortable than hardwood. Whether you’re designing a bathroom from scratch or remodelling an existing one, choosing the right flooring that suits your design aesthetic along with your lifestyle is important. 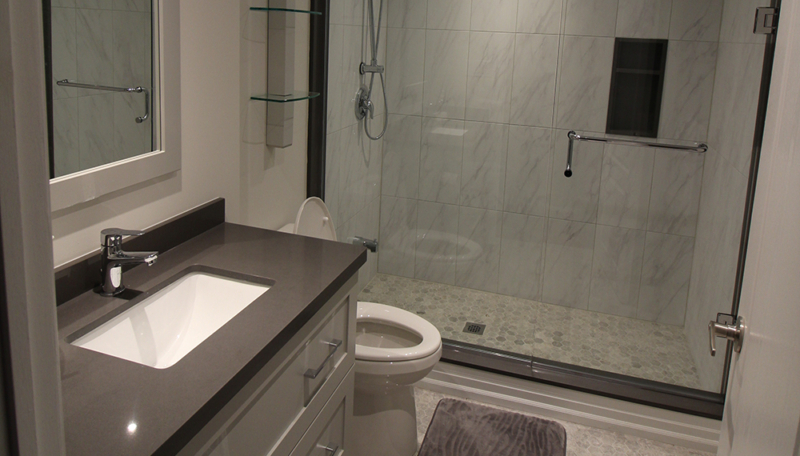 The right choice will ensure your bathroom is beautiful and functional at the same time.